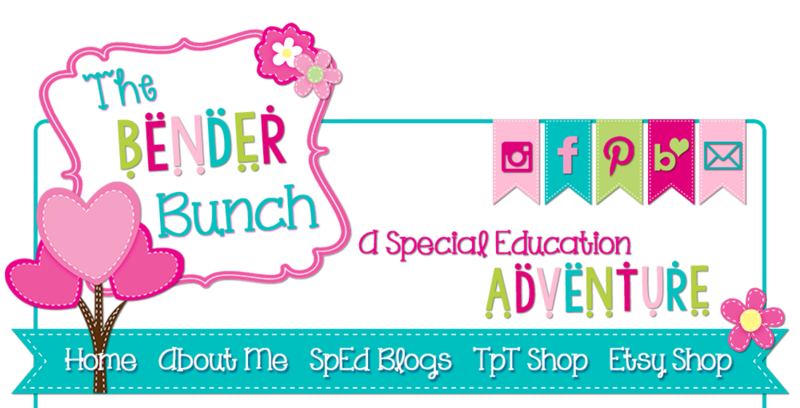 I'm sharing my Special Education Scope & Sequence with you today! This began as a work in progress last school year, and is still a work in progress, but is a fairly accurate outline of when and what I'll be teaching this upcoming school year. 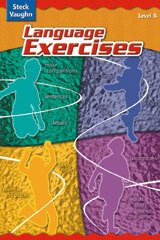 It is an intermediate scope designed for students in grades 3-5. I've also included clickable links, where applicable, for you to easily retrieve or look up the resource(s) that I'm using. These are nice reminders of what holidays and celebrations are coming up for the month to keep me on my toes and ensure I don't forget anything. My scope & sequence is broken down into 4 main blocks. My writing instruction is done in whole group. Writing is my favorite subject to teach, so it comes naturally, but I also use the "Step up to Writing" model. I love that this system uses a stoplight method and color codes writing, making it SO easy to teach anyone to be a good writer. I've used this program for over 10 years and have had a lot of success with it! 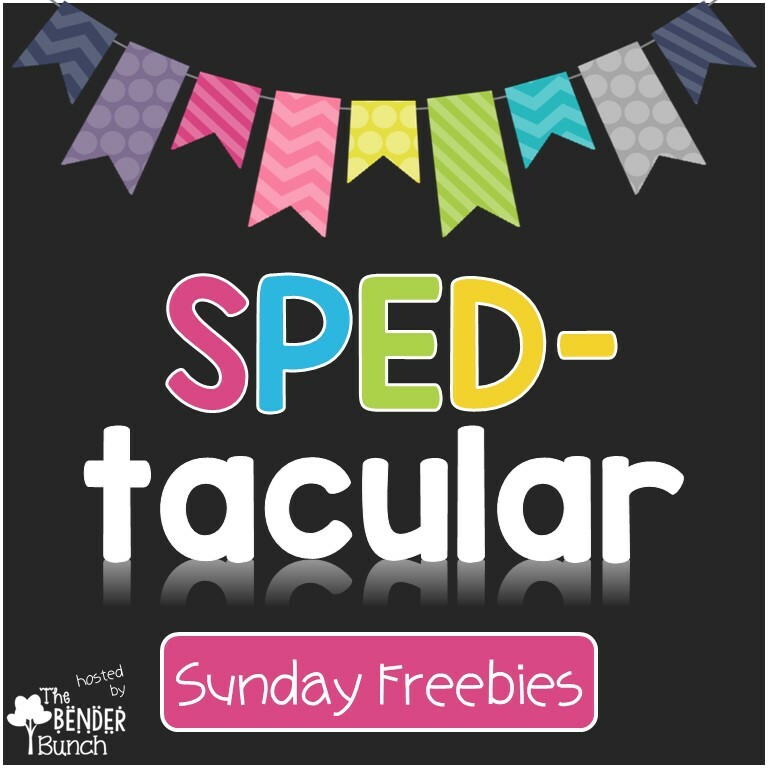 It's fabulous for special education! Another resource I use for my beginning and struggling writers that I forgot to link are these writing frames. As for grammar, I pull from here and there and also love Steck-Vaughn's Language series. It looks like they may have changed the cover since I purchased mine, but the link above is the link for these workbooks. I'm also currently working on grammar task boxes that will be posted in my store hopefully by the end of this week! Math instruction is done in centers. Many of my students take the alternate assessment, and my state provides NV Academic Content Connectors for these students that are linked to the Academic Content Standards. My math scope is based off of the third grade NV connectors. 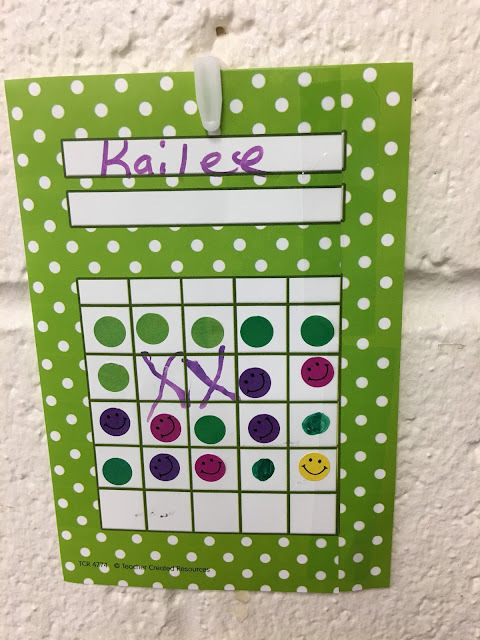 I also throw in lots of opportunities for life skills math like money, which is not included in these connectors and I believe is such an important life skill for our students. These subjects are taught in whole group and are rotated each day/week/month. So for instance, I may teach Science on week 1 and 2, Health on week 3, and Social Skills on Week 4. Then, the next month, I'll hit Social Studies. I typically do a social skills lesson at least one day a week though. This is also the block we squeeze in cooking activities. These subjects all share this block. 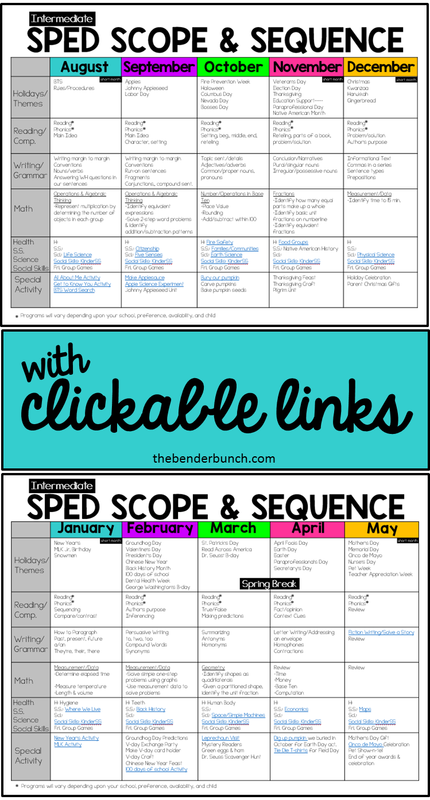 I've made most all of these links clickable for you to go right to the resource that I use. 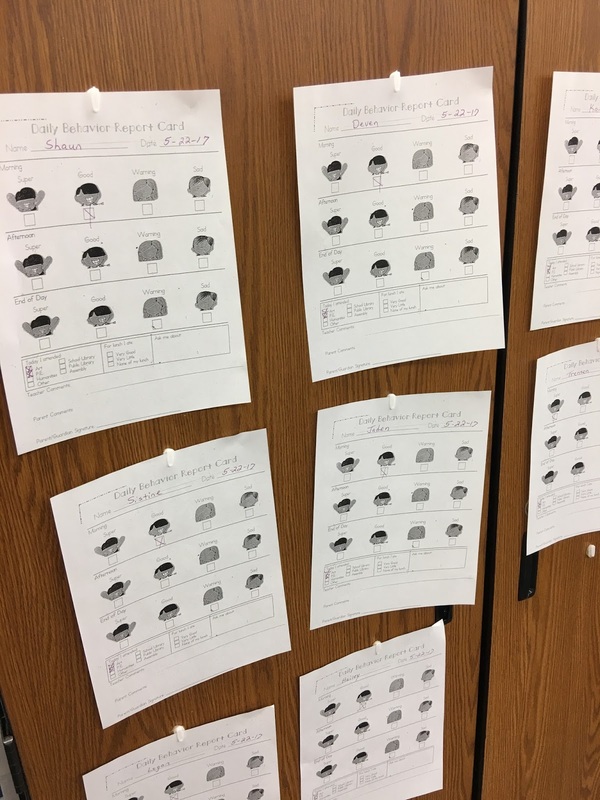 For Social Studies I began using Cara Carroll's first grade S.S. curriculum last year and found it to be a perfect fit for my students that are in grades 3-5. I used Tara West's Firstie Science Curriculum last year and also found it to be a perfect fit for my 3-5 kiddos. And it's super easy to adapt and modify for those needing a little more challenge or even less of a challenge. And of course we are obsessed with science experiments, so we also make time to squeeze in fun science experiments in between. This year I'll be using Tara West's Social Skills program. It looks fabulous, is low prep, and targets 75 different social skills that I'll use in the order as I see fit. Again, although designed for kinder and 1st, it's perfect for my 3-5 self-contained students that are mostly working at this level. Also, for social skills, every Friday we do what I call "Group Games." This is where we play structured games together like kickball, Mother May I, etc. to learn how to interact, take turns, good sportsmanship, and how to follow the rules of a game. We rotate indoor games with outdoor games every other week. Also, at the end of every day we have 20-30 minutes of free social time before going home. These are just special activities I like to do every year and to keep me on track. Last year, we totally spaced making our tie-die t-shirts for field day until it was too late and I was bummed! Now that I've added this section to my scope, hopefully this won't happen again! Life Skills you ask? Life skills are integrated throughout with our S.S., social skills lessons, class jobs, morning work/meeting, cooking lessons, etc. I currently have one student that is on a functional curriculum and his scope and sequence does look a little different. That is still a work in progress, but I use "A Work in Progress" and "FISH" as a guideline. I am hoping to finalize a scope & sequence for this area in the near future. Hopefully this scope and sequence will fit the needs of your students and ease your planning this upcoming school year. You can download the version with clickable links here or a blank editable version here. Want to save this for later?? Pin it here! I'm dropping by today to share with you what my classroom behavior management system looks like. Of course I also have individual systems in place too, like my cool points charts, self-monitoring sheets, and token systems you've probably read about...but this is an overview of my "whole" classroom system. 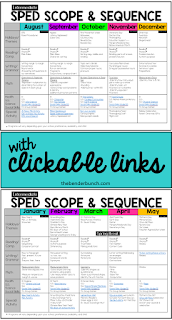 Yes folks, I do use a clip chart and love it! My system is much more than just a clip chart though!! It is not only easy for my students to understand, but is a very powerful visual for my students and let me tell you why. There are other components that make it so powerful! My student's take home charts completely align with the clip chart. The emotions on my clip chart match the faces on their take home charts. This is another thing that makes it so comprehensive and meaningful for my students. This allows all of my students, even my lowest functioning students to easily understand their take home chart. These hang in student view each day. Students having a rough day can often be caught sneaking a peek at their chart to see what they got. Students that end their day on good or super, get a small treat on their way out each day from this little drawer that sits at my exit door. 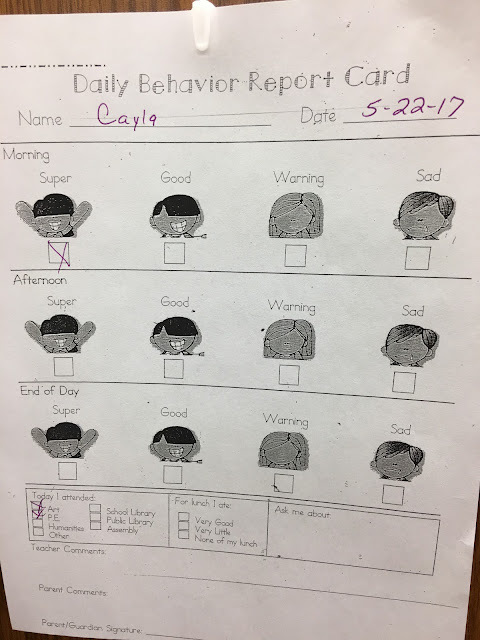 Again, this is very successful for your challenging behaviors, because it gives those students the opportunity to turn their day around, rather than figuring, "Oh, I already blew it and got sad so I may as well misbehave the rest of the day now." What else is key and makes this system so powerful is "The Treasure Tree." One of my classroom favorites! Every Friday, students that have ended every day that week on good or super on the clip chart, get TREASURE TREE! So there's a daily incentive and opportunity to turn your day around, and then this provides a weekly incentive. So how do I keep track of who gets treasure tree on Friday?? Very simply (and my aides do it). These incentive charts are marked at the end of each day with where they ended up on the clip chart. Here is what the colors mean. So, as you can see, this student ended on warning (yellow sticker) on this particular Friday, so she did not earn treasure tree. She did earn it though for the previous weeks; weeks 1, 2, and 3, and she got the "end of the day" treat on Mon.-Thurs. The two "X's" means she was absent or there was no school. This system is even more powerful when parents buy in and support it. I say this because the students that have consequences at home for coming home with warnings or sads, are the students that are not only frequently checking their charts, but are also the students that literally will cry when they have to move their clip down. 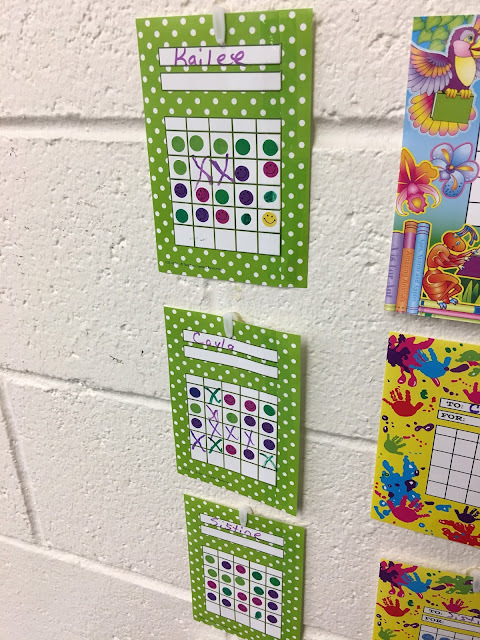 Students that don't have consequences at home, still want to follow it, because they want that end of the day treat and that prize they've been eyeing all week on the treasure tree. That's why the treasure tree is also another powerful component to this system. It is an incentive in itself. New prizes are added every Monday morning and they can't wait to pick out what they're going to work for each week when they arrive on Monday morning. It also remains there as a visual reminder all day and all week long! 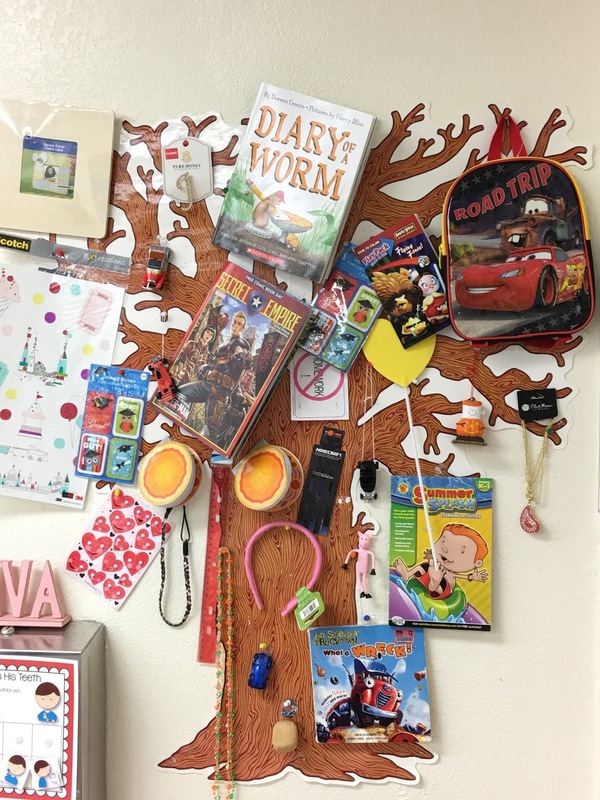 I also love the treasure tree because the time my students used to take rummaging through the treasure box breaking other toys trying to decide what they wanted, and me having to do a countdown to help them make a decision DROVE ME CRAZY! Not with the treasure tree. BTW, it is out of student reach. 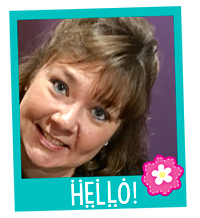 I could just go on and on, because I love my system so much and it is so effective! But I won't! I'll leave you with some frequently asked questions though, that you might have too. Q: What about dealing with more aggressive behaviors in the classroom? A: The first paragraph of this post has 3 links that offer suggestions with this. Plus, if you search "behavior" on my blog you'll find many posts. Q:What if a student is absent 3 days? Do they still get treasure tree on Fridays? A: No, I require a student to be at school at least 3 days that week to be eligible to earn treasure tree. It's not fair that other kids have to work hard all week to earn it. 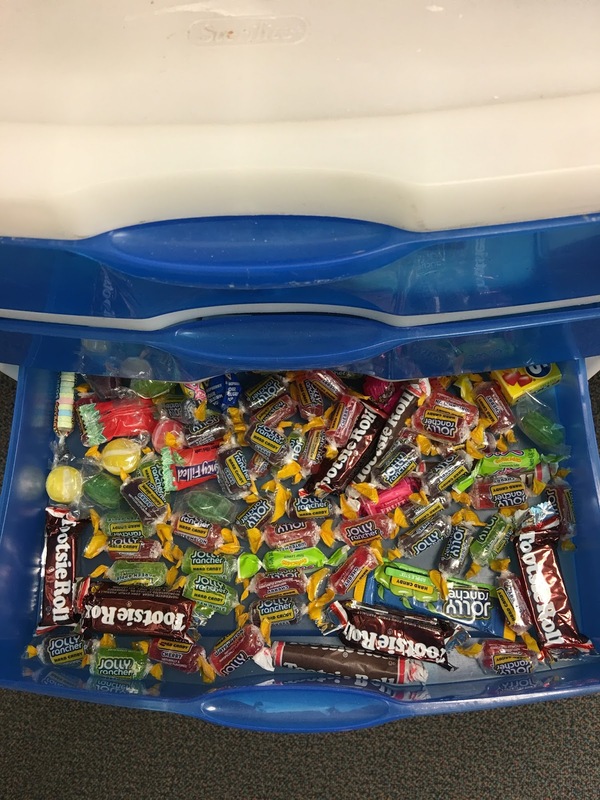 Q:Do you still give the candy/sticker treat at the end of the day on Friday too? A: No. That is only given on Mon.-Thurs. Q: How do you find the time to keep up with this? A: This is all delegated to one aide. My aide takes 20 seconds to mark "morning" on the take home charts on her way out to lunch. She marks "afternoon" upon their return from lunch and specials. Last 30 minutes of our day is "social time" and this is when she marks "end of day" and takes care of the stickers charts. Q: How are the clips moved? A: Students are simply asked to move their clip. They are always happy to move up, but of course not always happy to move down. If a student refuses and staff has to move it, then the clip is moved down two times. So instead of going to warning, they would go all the way to sad. Q: What if a student is ODD and simply refuses to use clip system and/or gets very angry and has a meltdown when clip is moved. A: Good question! Occasionally, you will have a student that you simply cannot ask to move a clip down due to their negative response to punitive consequences. For those students my "Cool Points" charts are very effective. Q: Is this a new system you started? A: No, I have been using this exact system in my classroom for 5 years and will continue because it is so effective and meaningful for my students. If it's effective, why change it? 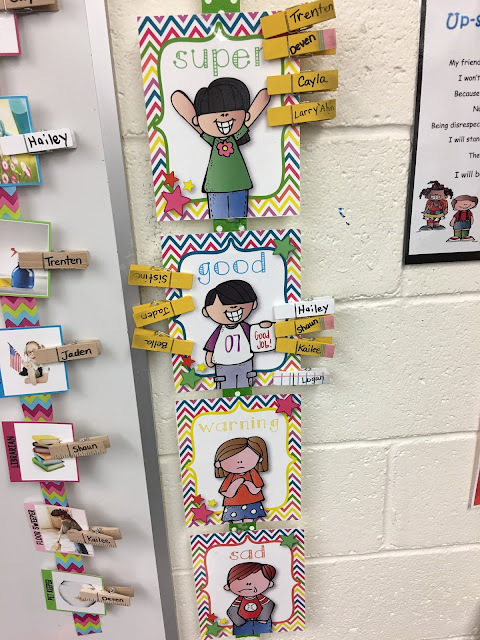 Q: If I use a clip chart will I be focusing on negative behavior? A: No, my classroom is centered around and functions on positive reinforcement. I believe in catching my students being good and reinforcing positive behavior, while ignoring the negative. "Praise the best, Ignore the rest" is my motto. But there are times when we simply cannot ignore a negative behavior and a child needs to be held accountable for his actions and learn to understand consequences. 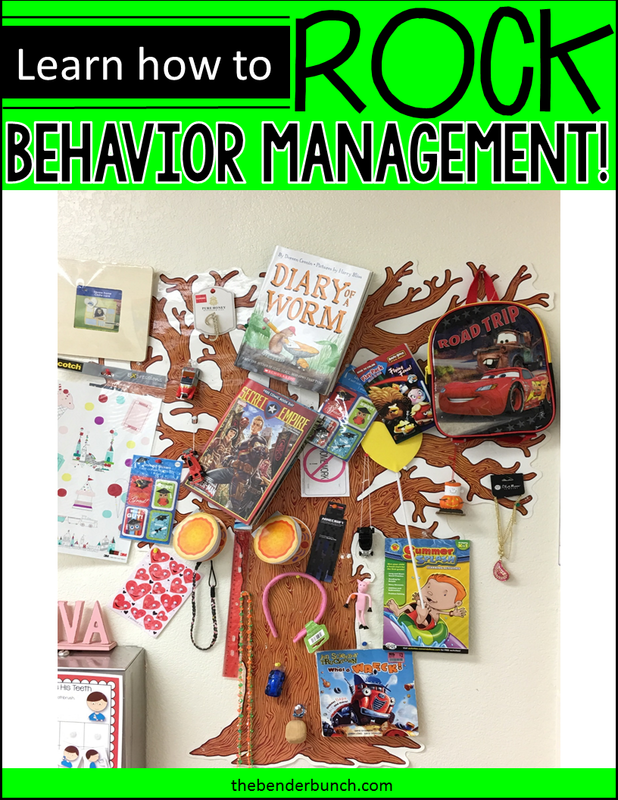 If you need something new and you'd like to give this a try in your classroom, the take home behavior charts are available in a few versions that I have customized for other teachers and are FREE at this link. You will find the clip chart link at the link above too. I couldn't find my exact tree I use for my "Treasure Tree" (5 yrs old), but you can find a very similar one here. Just remember with anything, it has to be implemented with fidelity and consistency. This clip chart could not stand alone. It would have no meaning whatsoever. It is the components that all tie in with it and the consistent implementation that my staff and I fulfill that make it so effective and powerful. If you have more questions, leave them below with your email and I'll get right back to you! 20 Brilliant Teacher Hacks You'll Love!